Last Edit: 06 May 2016 18:41 by madmaxx. Last Edit: 25 Nov 2015 07:09 by Monkeyz. looking nice now and this should move higher hopefully. Entry might be scuppered now with Swiss Bank announcements. 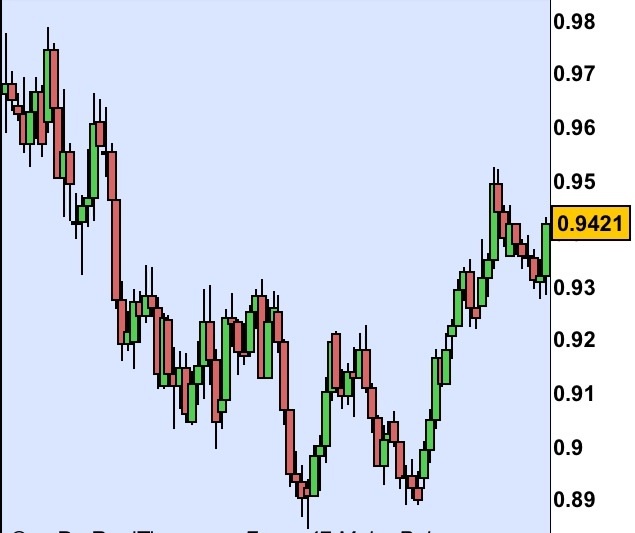 Possible 1-2-3 Low forming on AudUsd. Break of 8255 to show way. Correlated to Gold so watch it as well. That was good timing ! This has broken the trend line and moved higher. Im long on this from the 123 low breakout.. This how ever has since gone back down. Im still long on this with my stops below 0.8888(below the 2 point). But i may bring the stop up to just below the new uptrend line to lower the risk. For real strength to come this has to break the down trend line thats holding this back then this will signal an advance and an end to the down trend. The fact that it got a 123 low breakout suggest strength may be coming back?? Have to wait and see. Despite having this on my radar for a while I missed my entry last week. Can I ask what your thoughts are now ? This area has strong resistance so if it breaks it could be powerful. Yes reasoning is perfect: in essence you were shorting the $ so you would get funded. It's backtested perfectly so far at 0.8873 so stops below that for a long. Not sure if my eyes are deceiving me, but having just closed an AUD/USD trade via IG Markets (@ 0.89355), I noticed that in addition to the "winnings", I was also "credited" with a funding fee too. Don't get me wrong, it was a welcome addition, but usually for my CfDs and other Forex trades (GBP, CHF, and EUR as I recall), I would be paying a "funding" fee. Could this be to do with the pair - in that I was long AUD, but the trade currency was USD; thus, the funding fee would be negative for IG rather than myself? I took a long entry based on the weekly at the end of last week. First was the pin bar from December off the major support followed by an inside bar. Went long on a break of the pin bar high. This is more of a positional trade and looking to the highs of October .9757. Plenty of resistance in the way but time will tell. 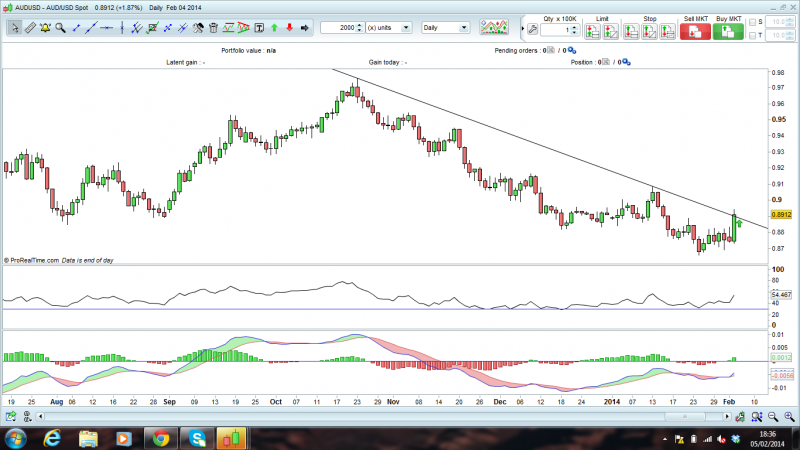 Possible 123 low breakout and trend line break???? Last Edit: 18 Nov 2013 07:52 by redchilly. Last Edit: 10 Sep 2013 10:13 by remo. 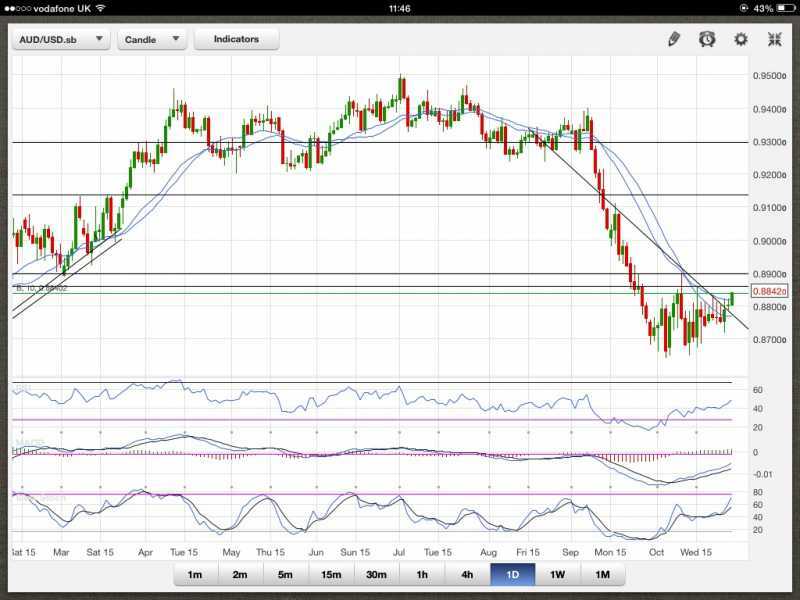 Trading AUDUSD long based on the H4 charts currently. Looking to move up to Daily charts if this rally continues. 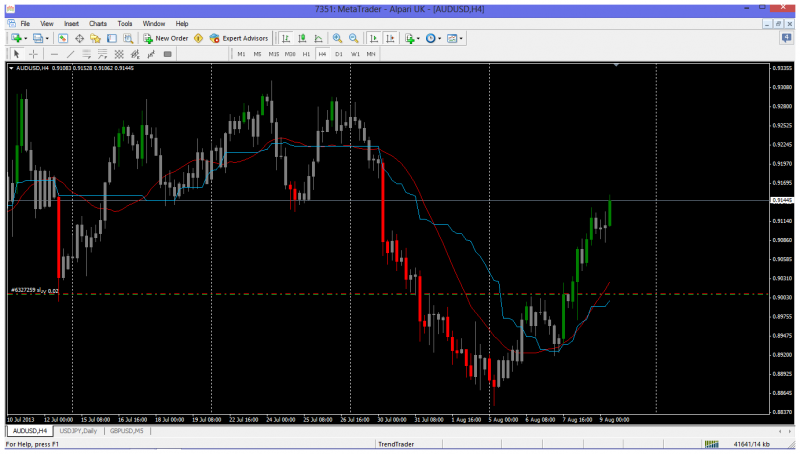 The position has closed half and is at better than break even on the SL now, so a winning trade whatever happens. The SL will trail the price as/if it goes up more. Libero - if you ever had the time, I think you should write a blog on using the ADX indicator. I found what you just wrote really very interesting and on the back of it I am going to read some more. Yourself and RC could discuss in much more detail there and perhaps everyone could learn. I thought those post were fantastic. Last Edit: 28 Jul 2013 23:26 by gclark25. Great post man, really detailed. Without wishing to hijack the AUD/USD thread anymore, ANTO's recent progress is discussed in the ANTO thread where a round-bottom is forming (hold your thinking there buddy - I know the sun out and you're bound to see lots of these, but I'm talking about charts this time! hehehe ) or a Cup 'n' Handle - which is a bullish case. Recently, I have been trading over a few days, but historically, I'm not far off from your time frames (10-14 days is familiar). DMI has served as a confirmer, a supporter to other indicators to be fair, so I'll give it the time of day and see where I am after a decent trading sample. I've got to say, you've got me intrested in the Linear Regression Indicator now, but I do wonder from a short-trading perspective, why "indicators" such as TRIN (Short-Term TRading INdex) aren't referenced often; surely they might be worth a look. Anyway, happy to continue this chat on the ANTO thread or another thread - perhaps a new thread called Technical Indicators? 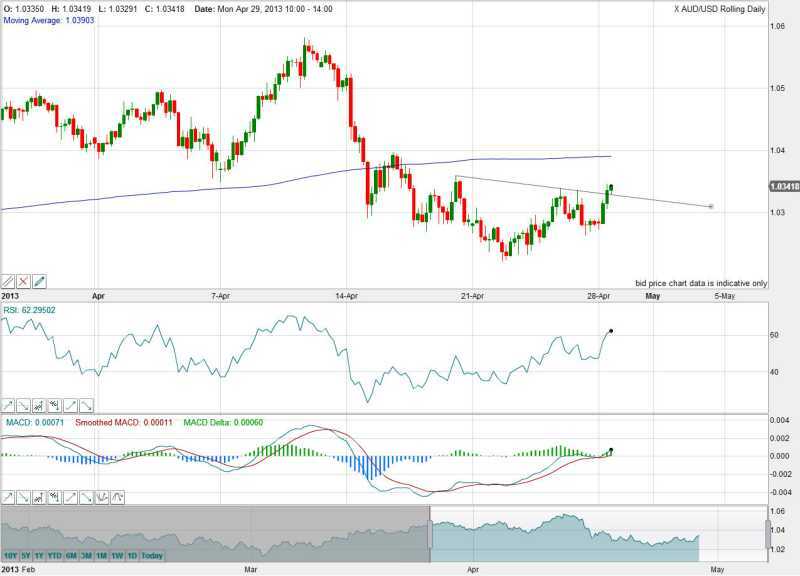 Before we awaken the over-worked and sleep-deprived AUD/USD Forex Traders! Thanks for posting your thingking mate! I am assuming that you are a short term trader (scalper/day trader) as I can see your trades are based on 1H chart and you are in and out 3 to 4 days (may be these are your cfd trades and the shares that you hold are for long term). Personally I am a short to intermediate term trader & I like to keep my trades running (or atleast a small risk free proportion of a profitable trade ) for 10 - 14 days. The miners have been doing well (most showing 123 lows) recently and the dilemma was which one to pick or which one will provide with a BEST trade (maximum profit,minimum risk). AAL, GlencoreXTA, RIO, ANTO, BHP billiton etc. Out of all I picked RIO and BHP (I have already posted my RIO trade on here and missed BHPs entry). I used to use Directional Movement indicator in the past but dont fancy it much currently as it was a lagging indicator. I even used to tweak it to refine the entry/exit but still it was giving many false results/whipsaws and was not to my liking. 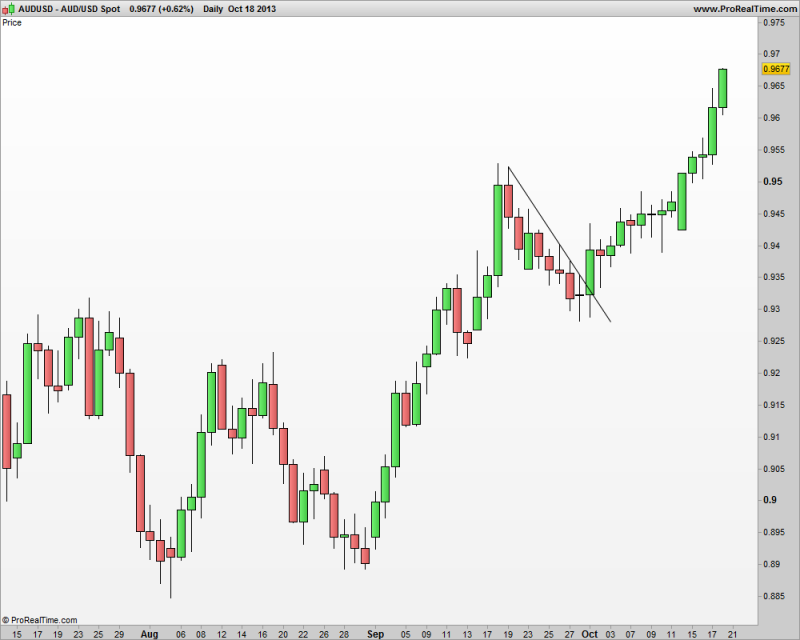 Here is an example of what I am on about on ANTO chart. Its a EOD daily chart. Your trades show DI 14 periods but I used to use DI 5 periods. Go long when DI+ crosses above DI- and go short when DI- crosses DI+. 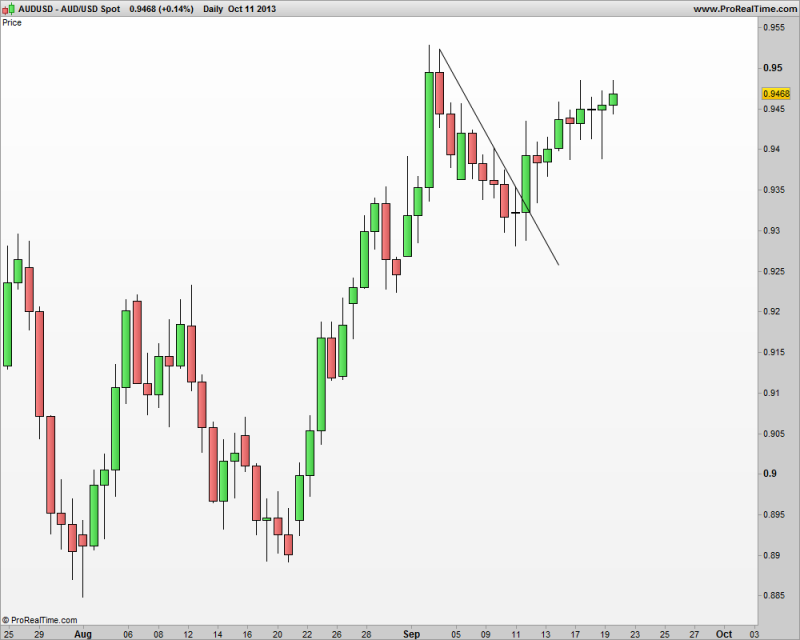 Short A trade was triggered on 5/6/13 (inverted hammer candle) and entry would be around 940. 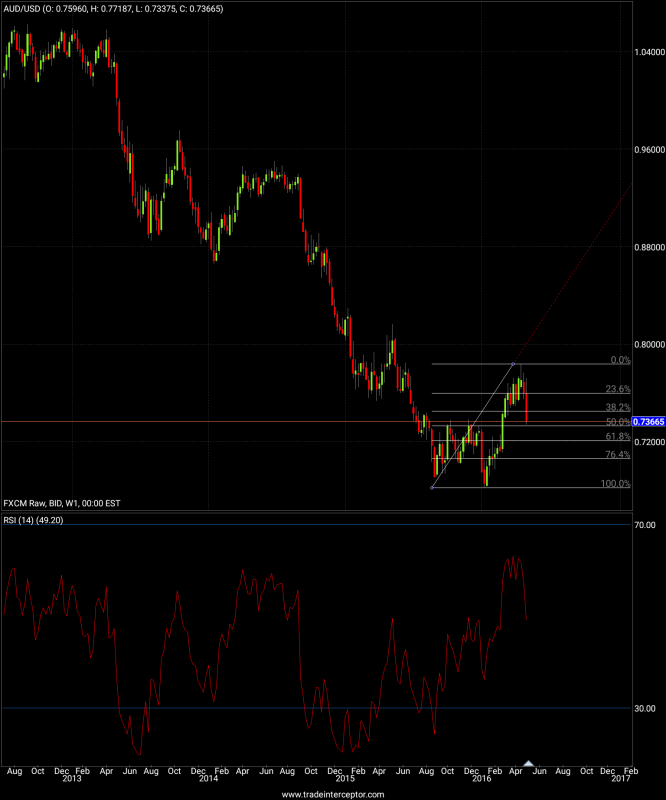 Sl would be above 965 (high on that day ). Exit the trade on 11/7/13 when it gapped up at the open at around 860 giving a profit of 80 points for 25 points risked (R:R of 1:3). 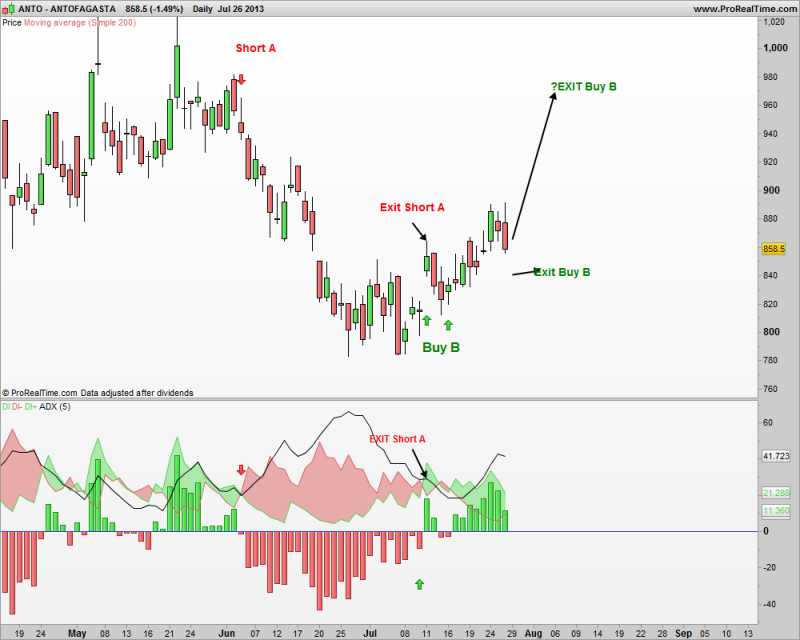 Buy signal B was triggered on 11th of July and again on 16th of July (gap fill ). Entry on 11th of July would need a very wide SL but entry on 16th was an IB (around 840, which is where I assume you have entered your Long trade) with SL below the low of previous days low (around 810). Trade would be in profit by now and probably risk free. Now this is a handy tool for scalping/day trading but I also like to catch BIG MOVES and hence this is another reason apart from the false negatives that I am reluctant to use it regularly. There's another question - is the current rise a bearish wedge which will break to the downside and result in resumption of downtrend or will it break the previous high (923)and result in start of a new uptrend?? Could using a Linear Regression Indicator answer the above question?? Nothing revolutionary (or evolutionary!) regarding how I use the Directional Movement Indicator. I find that it adds value on top of the other indicators and patterns. If we consider ANTO - which has been on my radar for a while - as an example... I "like" this share, having held them, and added some more on the 17/7. Additionally, I tend to trade CfDs (short or long) on the same shares that I own - maybe because when you watch something often, you become familiar with it. Anyway, a couple of trades via CfDs illustrate what I mean. As you can see, the first entry/exit wasn't too great - only 20 odd points! Still a profit is a profit. The next one was healthier, at around 40 points. The clincher for entry and exit for these two trades were the DMI. 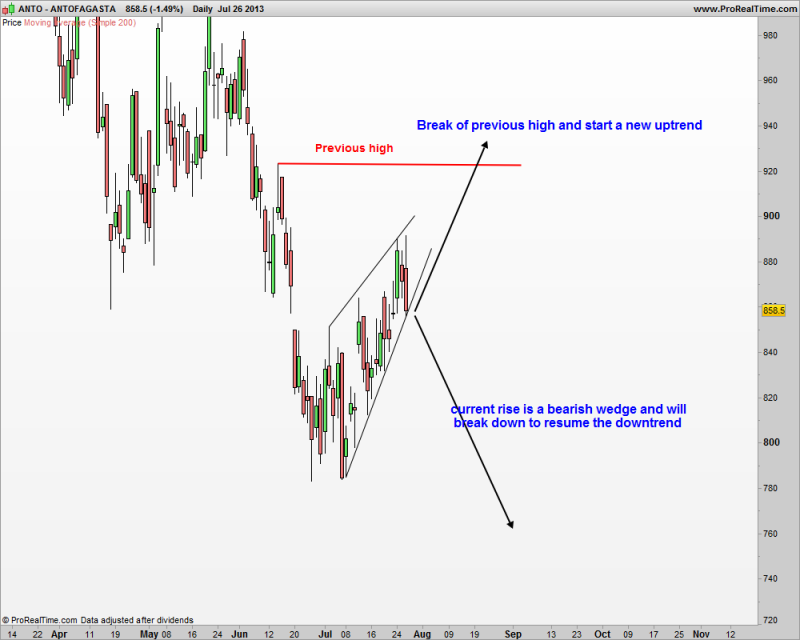 Trade one: Entered on what seemed like a Weak trend (DMI) - safety. DI+ is crossing DI-, but crucially, DI- is on the way down, and so it was worth the entry. Why exit? Well, DI+ and DI- were both aggressive in their moves suggesting a cross-over, so I bailed out collecting 20odd points. Trade two: Again, a Weak trend (DMI) - safety. DX+ is crossing DI- to the upside again, but this time the gap between them is widening, and getting bigger. Noticed that the trend is getting stronger - whilst DI+ was rising *and* DI- continued to fall. Stayed in the trade a little longer than the 1st trade, but decided to bail when the trend remained on "elevated", but this time DI+ was getting weaker, and DI- was getting stronger. Thus, bailed out because I didn't want to be in a trade where DI- is gaining too much strength whilst the trend was still relatively strong. As it turned out the trend weakened, but the crossover to the down side still took place, so it was the right decision in the end! This time the pay off was around 40+ points I think? There are more sophisticated ways of using it, and I'm trying to find the time learn this stuff, but for now, it has worked not only on a handful of trades, but also, I often refer to it when I'm undecided as to whether I should take a position or sit it out. Dare I ask why you stopped using it - was the same reason as Remo - it is too slow? I've not used Linear Regression since the 90s (Uni + some analytical stuff for a job at the time), but I might look into it time permitting! Last Edit: 28 Jul 2013 01:49 by Libero. I did think about this trade - a lot - but didn't go in at the end. At the risk of having my chart looking like a Xmas Tree centre stage of a Russian Circus, I do take the ultra cautious approach and have indicators to supplement the candle patterns and trends lines, for confirmation's sake. Whilst I appreciate the merits of RSI and MACD, which are firm favourites here, as well as the second favourites of Stochastics and Bolinger bands even, but I tend to go with the less fashionable one for that doesn't maximise entry or exit points, but it does help me preserve capital, and that's the Directional Movement indicator. 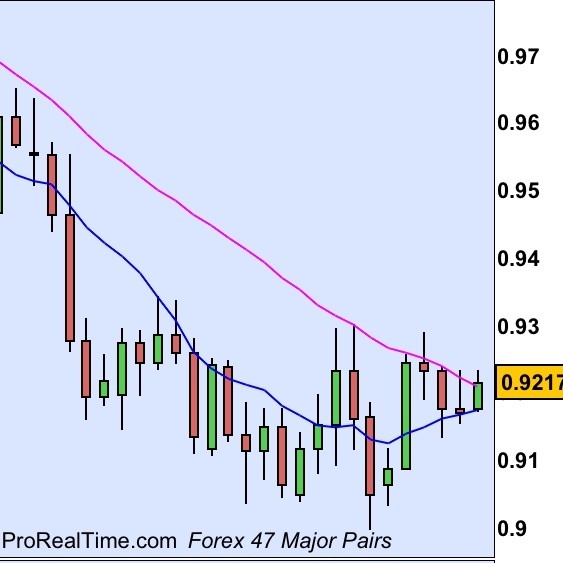 For example, right now, the trend is firmly with the USD over the AUD on the hourly - which is useful for forex, whilst the daily DMI is useful for stocks. Do you have a view on it, or a wider question might be how much importance to do you place on indicators in general? Interesting to know that someone here gives importance to strength of trend by using ADX. I used to use it in the past but not any more. Would you be kind enough to share in what way do you use ADX or Directional movement indicator? Also have you come across Linear Regression Indicator or used/use it by any chance? Last Edit: 27 Jul 2013 22:24 by redchilly. For my style of day trading indicators are to slow.I find indicators are better for medium term trades. 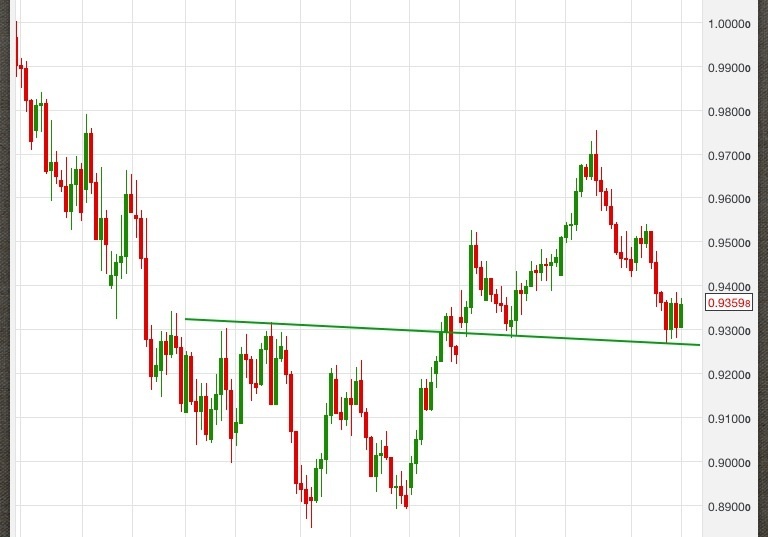 If you have seen my trade history you should be able to tell that im more of a first attempt basis trade of resistance or support.All this requires is a well drawn trend line or support and resistance lines. I find that a share would not go through a strong resistance or support on first attempt. Patience is required for this style of trading but since theres thousands of shares you will always have some thing to trade. This was a false breakout and got stopped out .Lucky for me my stop was 40 pips..
Last Edit: 24 Jul 2013 20:10 by remo. This did trigger for me so im long on this. Surely you mean the SL is around 0.91xx and not 0.9255? I see this as an "anticipation trade" looking for the MA cross-over?